The top priority in most business turnaround strategies is to speed up and stabilize cash flow, giving a company time to cut expenses, grow sales and regain momentum. Invoice factoring can play a key role as part of a business turnaround plan; here’s why. 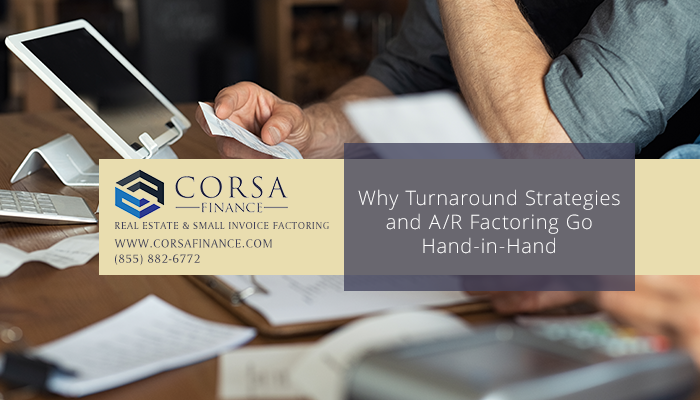 Implementing tactics for stabilizing cash flow and collecting payments on invoices as quickly as possible is usually priority one when business turnaround consultants come in to help a struggling business. Why? 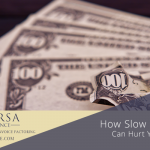 Simple: Speeding up cash flow buys time for a struggling business – time that is critical to allow business restructuring, operational, personnel and procedural changes to be enacted, take root and begin making a difference. In Best Practices for Turning Around Distressed Companies: The First Steps, the CEO and managing partner of NYC Advisors LLC advises that step one in a business turnaround strategy is to get control of cash and cut unnecessary expenses, including “Collecting your accounts receivables as quickly as possible,” even if it means offering cash discounts for faster payment. In lieu of offering cash discounts to customers for remitting payments within the first few weeks after an invoice goes out, a struggling business could receive payment on a customer invoice within 1-2 days of when the invoice is generated by factoring, or selling, the invoice to a factoring company for a small fee (called a factoring fee). Furthermore, the factoring fee charged for same day payment on customer invoices will probably be significantly less than a quick-pay customer discount and may even be tax deductible. 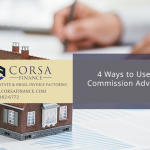 Early pay discounts may need to be fairly significant (5%, 10% or even more) to get customers to pay right away, whereas your factoring fee will likely range between 4-8%. Invoice factoring offers a business tools that can stabilize cash flow right away, at a minimal cost. We have programs with factoring fees that start as low as 4 percent which is less than many customer early-pay discounts. In addition, instead of waiting a couple (or several) weeks for customers to pay, factoring clients can get free same-day funding on invoices factored with us, with advances up to 90 percent of an invoice amount. For struggling or distressed companies, low cash flow is often the most pressing challenge to address. Speeding up cash flow is a top priority. Without adequate and consistent cash flow, a struggling business will not have time to remediate the problems with its pricing, personnel, marketing, purchasing, overhead and other operational areas that can turn a struggling company back into a thriving enterprise. In other words, speeding up cash flow gives a struggling business the working capital needed to put other components of its turnaround strategy into motion. Invoice factoring enables businesses that invoice customers for payment on terms to collect payment on invoices immediately, without waiting for customers to pay, for a small fee (called a factoring fee). We can help distressed companies get agreements into place so they get an advance of over 90 percent of the face value of the invoice within 1-2 days of when an invoice is factored at a small cost (or factoring fee) which could be as low as 4 percent. In this example, factoring the invoice gives a struggling business access to as much as $9,300 on the same day the invoice is generated, and ultimately collects another $300 for a total of $9,600 collected. If the same business elected to extend a 5 percent within 14 days early pay discount to its customer instead, it might wait up to two weeks to collect any money on the invoice at all, and still only receive $9,500 of the invoice amount. If the customer elects not to take advantage of the early pay discount, the business could receive the full amount but may wait 30, 60 or even 90 days to collect on the invoice. In addition, the business owner or bookkeeping staff may have to invest hours of time on collection phone calls and reminders before the customer pays. Another advantage of choosing invoice factoring to speed up cash flow as part of a business turnaround strategy (instead of offering customer fast-pay discounts) is that the business can continue (or begin) to extend favorable payment terms to its customers as a marketing advantage. Since the business can collect on the invoice on the same day it’s generated, it does not have to spend time or resources chasing payments or worrying about how quickly a customer will pay. A free, no-obligation quote is all it takes to find out how factoring invoices can instantly speed up and stabilize your organization’s cash flow, creating a consistent flow of working capital that enables your business to regain market share, keep customers, employees and vendors happy and put your company on a faster track for growth.